Most graduate programs require students to write a “personal statement” or “statement of purpose” as part of the application process. This is true for master’s, doctorate, and professional graduate programs. And for many, this is the most difficult part of the application. The upside of your personal statement is that it’s a part of your application over which you have total control: your grades and test scores are set; others will be writing your letters of recommendation; and your CV/resume will be a product of experiences you have accumulated over many years. The personal statement is your biggest opportunity to improve your application. So how can you write a good one? A description of your motivations and past experiences that have prepared you for graduate study. A summary of your current interests and description of why you think the program to which you are applying is a great fit for your aspirations. A section discussing future career goals and how their program can help you get there. While opinions differ on how much space you should devote to each section, my personal advice is to allow about 40% for past experiences, 40% on current interests, and the remaining 20% on career goals and ambitions. Why do you want to go to graduate school at this particular point in time? How have your past experiences prepared you for graduate school? This should not just be a rehash of your CV. Instead, you want to thoughtfully select a few standout experiences and discuss how they have provided you with a passionate interest in the field and the basic knowledge necessary to excel in a graduate program. For those seeking a research-based degree, discussing research experience is a no-brainer while those going into professional programs might discuss previous jobs or internships and how they related to your interests. What exactly do they mean by “personal” statement? Graduate schools are interested in your personal professional life. Therefore, you want to keep the tone and the examples given in your statement professional. The admissions board isn’t interested in the fact that you’ve wanted to be a paleontologist since you were five years old, or that you’ve “always” wanted to be a college professor. Not only are these themes overused and cliché, they can give off the impression that you are not treating your future career seriously – that you are still looking at the field through the lens of a dreamy child instead of a thinking adult. If it helps, think of the “personal statement” as a “professional statement” and don’t get bogged down in stories that don’t fit that theme. Likewise, you should avoid personal struggles that inspired you unless they are unusually profound. In clinical psychology, a very common theme is to write about a family member’s mental illness that made them want to enter the field (or even one’s own). But a large recent study of graduate admissions officers have labeled this a “kiss of death” for graduate admissions. The same goes for writing about how a family member’s serious illness made you want to become a physician, or that a favorite cousin was an engineer. What time period should you focus on? Focus on accomplishments from college and beyond. Frankly, the accomplishments you made in high school no longer matter, so you don’t want to discuss being a National Merit Scholar or being on high school Model UN. The rare exception would be if you did something truly exceptional in the later stages of high school (i.e., if you are applying to a music performance program and played at Carnegie Hall, or if you are applying to a science research program and did research with a professor or won the Intel STS in high school). Otherwise, stick to things that you accomplished after you graduated from high school. Your second section should be about your current research and/or professional interests and why the program you’re applying to is a good fit for you and for them. If you are applying to research programs, you should describe in detail the kind of research you want to be involved in. If you are applying to professional programs, you’ll need to talk about your current professional interests as they relate to the field. How specific do you need to be? If you are too vague, it appears as though you haven’t quite thought through your professional interests. But if you are too specific, you may end up proposing something that is not feasible at the institution you’re applying to. It’s best to propose a relatively broad area of inquiry, allowing room for exploration, with some sharper details sprinkled throughout in a way that portrays you as someone with a clear focus who can also be flexible. You also need to make sure that you tailor your personal statement to reflect the program at each individual institution that you apply to. This is probably the best section to do that. You should make it clear that you have done background research into the university, department, and program that you’re applying to. If you’re applying to a PhD or Master’s program with an interest in research, you should try to mention two or three faculty members in the department who are doing research that interests you (and who could potentially serve as your faculty advisor). If the university has any special libraries, collections, centers, initiatives, or sub-programs that are particularly unique, describe how access to those resources will specifically help you reach your research and career goals. You want to convey to the admissions committee that you have done your homework, and that their university is the best place for you. This last section of your statement should focus on your future career goals and how their program can help you achieve them. Graduate committees are interested in what their applicants plan to do with their degree, since those people will go on to represent the university in the world. You should present some clear goals in this section, even if you’re not absolutely certain about what your goals are. Remember, at this stage your primary goal is to get into the best graduate program that you’re able to. Once you’re in, your career goals can change — and they probably will. The faculty at the university you’re applying to have all gone through the same process themselves and they know and expect that everyone’s goals and aspirations change. If you don’t know whether or not you want to enter academia, that’s OK: after all, this will likely be your first foray into professional academia, so how could you know? Instead, emphasize your broad ambitions and the ways in which their program can enable you to succeed over a spectrum of different goals. This is a good note to end on, as you repeat here that their university is an ideal fit based on your experiences, your interests, and your future goals. 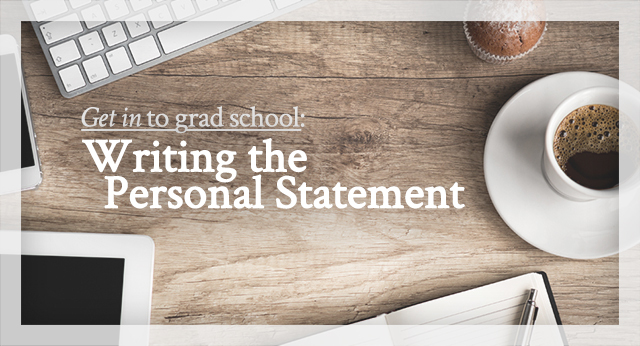 Your graduate school personal statement is a crucial aspect of your application and one for which you should devote a significant chunk of time and energy. Not only do you need to hit the right points, you also need to do so in a technically flawless essay (tip: have a professor or someone else with excellent writing skills read and edit prior to submission). But if done right, the personal statement is your best opportunity to make your application stand out. This entry was posted on Sunday, November 9th, 2014 at 11:23 am and is filed under Surviving Grad School. You can follow any responses to this entry through the RSS 2.0 feed. 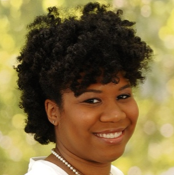 Melissa Boone Brown recently completed a PhD in Sociomedical Sciences & Psychology at Columbia University. During her graduate career, she worked as a teaching assistant and as a National Science Foundation Graduate Research Fellow from 2010-2013. She is currently a postdoc at Pennsylvania State University, where she conducts research on substance use and HIV risk behavior. Melissa also writes a weekly column on life as a graduate student for Student Pulse.